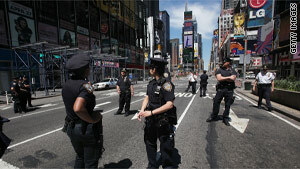 Police block off a section of Broadway in Times Square on Friday after a suspicious package was found. New York (CNN) -- A suspicious package in Times Square prompted an evacuation and raised alarms in a jittery city Friday afternoon until authorities determined it was a false alarm. Investigators determined after an anxious hour or so that the suspicious package -- a green cooler -- contained only water bottles. The cooler was found near 45th Street and Broadway, outside the Marriott Marquis hotel, witnesses and police said. That's near where authorities say a U.S. citizen of Pakistani descent left a car bomb that failed to detonate six days before. Police evacuated parts of Times Square around 1 p.m. ET as they investigated, though people remained in the hotel and nearby buildings, said Kathy Duffy, a hotel spokeswoman. "Our buildings were not evacuated," she said. "Our hotel has not been evacuated." But nerves were on edge in the area. Shortly after the all-clear was given in Times Square, authorities said they were investigating a suspicious truck a few blocks west at 45th Street and 10th Avenue in Midtown's Hell's Kitchen neighborhood. A few minutes later, the all-clear was given for that, too. In last week's car bomb case, authorities say that Faisal Shahzad, an American citizen who is originally from Pakistan, left a car bomb in Times Square that failed to detonate. Investigators arrested Shahzad after he had boarded an airplane with plans to leave the United States, authorities said. Mayor Michael Bloomberg of New York acknowledged after that incident that terrorists have targeted New York. "We will continue to doing everything we possibly can to protect New Yorkers from terrorist attacks. We have, as you know, built the most comprehensive and sophisticated counterterrorism operation of any local police force in the world."